Washington, DC, January 22, 2013~Ella Jenkins is a pioneering music educator and children's performer who wears the title given to her by her many fans, "The First Lady of Children's Music." 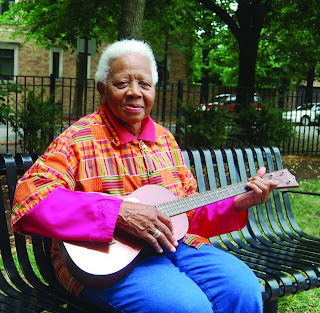 Now in her 9th decade, she is still going strong with her 33rd title from Smithsonian Folkways Recordings. Her first record was in 1957! Get Moving with Ella Jenkins is a collection of 15 recordings, including 3 previously unreleased on CD, featuring Ella's core principals: rhythmic movement, careful listening, singing and improvisation. She has been instrumental in integrating these developmentally important skills into early childhood education in her nearly 60 year career. 60 minutes of pure fun! I have always enjoyed Folk music, being from the era of my folks listening to Peter Paul & Mary, James Taylor, and Simon and Garfunkel. Each are still on my ipod today! I love that Ella Jenkins has that folk sound for my young children. She eases them into great songs with movement and sing alongs. Enter to win a copy of this energetic Cd via the rafflecopter below. My grandkids live in Florida. They continue their routine of bike riding and swimming plus wii games. Dancing! Getting outside when the weather isn't so bad. Lots of running around at the park. I received this today!! This is going to be a special treat in a little one's Easter Basket!